As I’m writing this update there is yet another snowstorm this afternoon, with the school closing early yet again. However, JMHS remains open to see patients that are willing (or sick enough) to venture out in the storm. 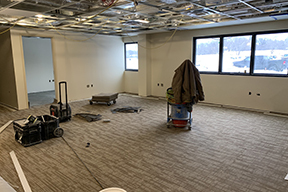 Much progress has been made on Phase 3 (new Hosp/Clinic Entrance & Waiting Area, Business Office, Telemedicine Room, and the Conference/ Meeting Rooms), as we are aiming for a mid -March substantial completion on this phase. The internal demo and work on the Outreach Clinic space continues. The Lab Department moved to its temporary location in the old OR space on Monday, Feb 18th. Which means we can begin construction in the lab to improve work flow, but also provide more spaces for lab draws. We have been working on finalizing our internal signage needs with Wold Architects as well. These previously discussed areas should all be completed by mid-late spring 2019. Although the entire construction project can at times seem never-ending, we need to remember to see all that has been completed. We are embarking on the final stretch, and can’t lose steam now! Stay warm everyone.